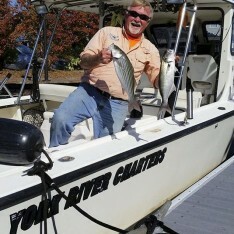 We caught our first “keeper” rockfish of the 2014 VA Chesapeake Bay Fall Striped Bass Season this week! As the fish were caught on light spinning tackle, our anglers had major fun landing their fish. In addition to Stripers, our guests are catching Bluefish, Speckled Trout, Grey Trout(Weakfish) and Flounder.